The miles are adding up. 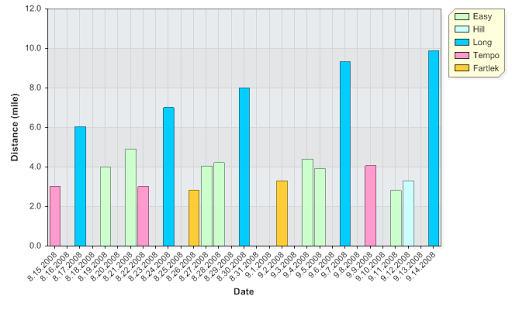 This chart shows my runs from August 15 through Sunday September 14. But in terms of knee pain, or muscle soreness, there is less of that than I am accustomed to from the spring. Previous Hill running DOES make one faster—sort of. Good news! And nice chart.I find that I drink about 2 oz. of water per mile… because I have a 20 oz. bottle and often have lots left on my “short” longruns these days. See, Gordon? You can do it! That is exactly why you use a training plan! What training plan are you using?I am using a Hal Higdon Modified Novice Marathon training plan. It looked impossible but I was ready at every stage. You will be, too! Thanks for checking out my blog Gordon. I know what you mean about the miles adding up, but it’s great to be able to keep increasing. Oh oh! So busy running that you don’t have time to blog!